I was at the launch on the 23rd of February (2012) of the book Slow Architecture and Place, which was a considered response to the Slow Architecture exhibition that took place during the summer of 2010 and the Autumn of 2011. In this case ‘launch’ was about as apt a term as you can get, as the exhibition had been located on a barge boat and floated off down the Grand Canal from the river Shannon to Dublin, creating temporary exhibition spaces along its route. Part of its mission was to get school children involved as much as possible, which was helped by interactive and participative works from exhibition pieces such as Slowweave (Caelan Bristow), Draw (Architectural Farm), Thinking Town (Solearth) and Life-cycle (Sonairte). Artists Róisín de Buitléar and Susan Jane Dunford responded to the idea of slow, and to the physical manifestation of the exhibition through their pieces, while also examining building materiality and effects of time upon it. Architects Donaghy + Dimond, Sean Harrington, Michael Carroll, Carson Crushell Architects and Emmet Kenny responded with studies at a range of scales, from the close analysis of the materiality and form of a town house extension (Donaghy + Dimond) to the making of a town (Emmet Kenny); and analysis using time as the focus in the approach to architecture, in the process of designing built environments, and in constructing buildings and places. These exhibits ranged from considering urban situations to the isolation and fragmentation of rural communities – as well as the potential for more flexible and mobile water-borne archetypes. 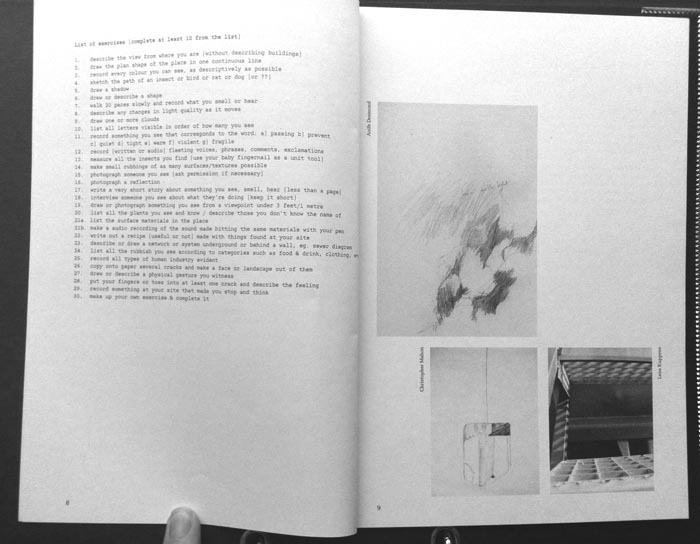 The book contains four reflective essays, variously pitched as reactions to the exhibition and to the idea of slow architecture. 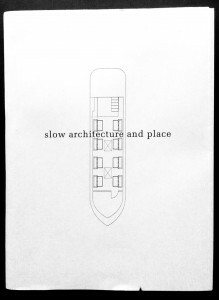 The term slow architecture purposely and provocatively is left without a clear definition; this definition was asked for from the contributors themselves, and the same challenge is accepted by essayists Mike Haslam, Brian O’Brien, Ciaran Cuffe and Donal Hickey who draw on their experience as architects, design educators and, particularly in the case of the former Minister of State Ciaran Cuffe, politics. Instead, slow is split into a series of disparate themes relating to, as Mike Haslam puts it, “the joy of making and building, the care in the choice of materials, engagements with a community, the vision of a town [or national] plan or even a way we look at our environment”. A number of the contributors made critical reference to the recent collapsed economic and building boom (the p-recession, as it were), and nailed the accusation of haste to it as a major contributing factor, which according to Donal Hickey “precluded any rational reflection on its value”. Donal sees the challenge of slow architecture as one of producing advocates (amongst architects), and encouraging activism. Brian O’Brien advocates slower design and slower building, pointing toward the cathedrals of medieval Europe and 20th Century Barcelona, and noting that fully understanding the people who will use buildings, and the material and social culture within which they will exist, can only be achieved in a slowed down process. Ciaran Cuffe reminds us that small scale and considered approaches are working in the food and wider agriculture sector, and that the wider societal role of architecture is being addressing by government through tighter energy conservation regulation and through the Government Policy on Architecture (2009-2015). The question of what slow architecture remains open, and hopefully will continue to spark debate, now that time has become a commodity that can be afforded once more. The rush to get things built now! was driven by the conscious realisation by developers that the boom would come to an end, but without any projected sense of what the built legacy would be. Now that legacy is being appraised, but it will take time to figure out how to unpick our mistakes – this publication is as good a place as any to start. I was delighted to be involved (in a marginal capacity) with curating this exhibition, and despite this bias would recommend Slow Architecture and Place as a timely reflection, floating on “calmer waters” as a counterpoint to the “economic turbulence” we are facing, and in the aftershock of some crazy ad-hoc development. It is available from the RIAI bookshop on Merrion Square, or you can email info@slowarchitecture.ie for more information.